Veterinarian Dr. Ernie Ward knows about dogs, and he knows about hot cars. As many pet owners know, locking dogs in a hot car is something that shouldn't be done at all. Not even if it's only for a few moments while you quickly run into the local store. In the high summer temperatures dogs can overheat and it can be devastating. Still, even though it's something that is constantly being cited as something you should never do, dogs are still left alone in hot cars. Well now Dr. Ernie Ward, has taken it upon himself to demonstrate exactly what it's like for these poor animals left alone in hot cars, which are uncomfortable and potentially deathly environments. He valiantly does this by putting himself into a hot car and sitting there for 30 minutes, suffering through the heat to prove that locking animals in hot cars is just as problematic as if you had locked a child in one. Dr. Ward initially undertook the 'How Hot Does it Get in a Parked Car' experiment in 2012 but it has recently come to light again after The Dodo republished the video. The video was shot in South Carolina on a typical summer's day and the vet cracks all the car windows open a couple of inches just as someone might if they left a dog in the car, thinking this might help (it doesn't). The moment he steps into the car he starts a timer and also takes the temperature. It's 94F right at the start, which is already too hot. But things are only just getting started. 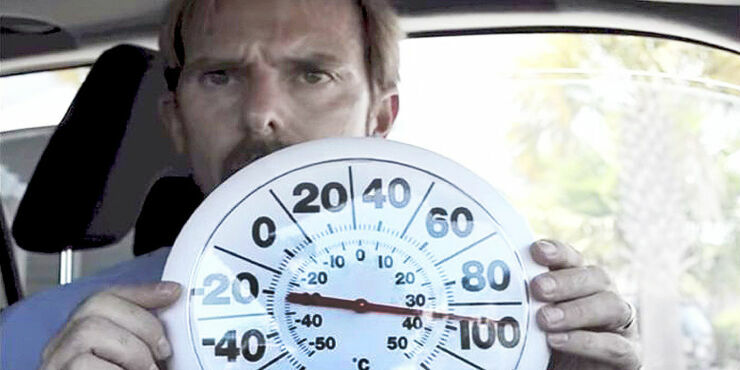 Another five minutes and it's hit 100F with Dr. Ward describing it as "stifling." What is disturbing to watch is the speed at which the temperature rises. After 25 minutes it's 113F and after the full 30 mins it's up to 116F. Dr. Ward is sweating hugely (which he notes a dog is unable to do) and says his body is just crying out for him to get out of there. It's a demonstration that speaks for itself, and that's without even getting onto how scared a dog would be in such a circumstance, as the vet makes note of. While Dr. Ward can perspire to keep cool and knows what is happening, dogs can’t and don’t. "I know what's going on, I'm in control of the situation." 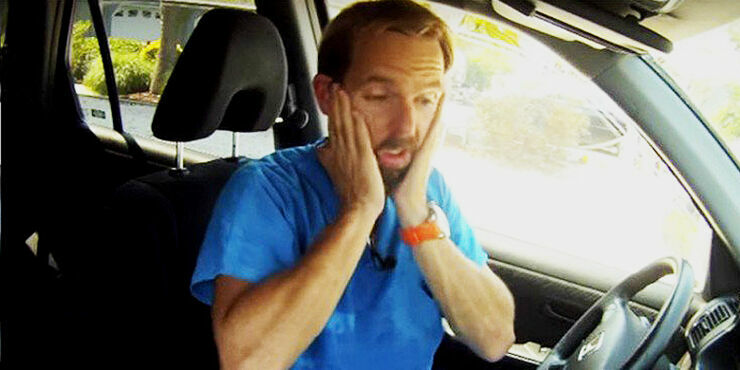 Dr. Ward says about being in hot cars. "What I can't imagine is how helpless and frightening it would be for a dog to be left in a car not knowing when you're gonna come. And slowly but surely having the energy and the life just burnt out of them...Never ever leave your pet in a parked car in warm weather. Even if it's just for a few minutes...Hot cars are a potential killer."